Do you help manage a Twitter account for a law enforcement or other government agency? Do you want to learn how you can more reliably grow your Twitter follower base? If you answered yes to either of those questions, keep reading. In this GroupTweet case study, we examined Twitter data for 28 different Police Department Twitter accounts to try to learn if there is any secret sauce to achieving Twitter success. For the purposes of this study, we define “Twitter Success” as stronger than average Twitter follower growth compared to other comparable police department Twitter accounts. After all, at the end of the day, the more followers your department has the easier and more efficient you will be in delivering your message and achieving your goals. Nearly every police department across the United States now has an official Twitter account. Twitter use has grown rapidly among law enforcement and other government agencies. Before we dive into how you achieve success using Twitter, lets examine WHY law enforcement agencies are even using Twitter in the first place. Its easy to simply create an official Twitter account for your law enforcement or government agency and send out a couple Tweets here and there. When we examined the data, we discovered that a lot of law enforcement agencies are not getting the full potential out of their Twitter efforts. If your agency is only sending one or two Tweets per day, you are missing a huge opportunity to engage your community and accomplish the goals listed above. How are agencies accomplishing these objectives? The chart above summarizes the goals and objectives for Law Enforcement agencies using Twitter. As mentioned above, the more followers a police department has, the more effective and efficient they are going to be at all of the items listed above. If a police department is trying to get out an important message, the more followers they have will lead to more retweets from these followers which in turn spreads the message much more quickly. If your department only has 100 Twitter followers, its going to take a while for you message to get noticed. However if you have thousands of followers, your message will spread much more quickly and efficiently and you will have an easier time achieving your goals for using Twitter in the first place. So, at the end of the day, one of the primary keys to accomplishing success on Twitter, is to make sure you build up a big audience of Twitter followers. The GroupTweet Data Set – Which Departments Are Having Success on Twitter? For the purposes of this case study, we wanted to make sure we were using an apples to apples comparison and only comparing Twitter follower growth for accounts that had around the same number of Twitter followers in 2013. Our data set includes Police Department Twitter accounts from 28 different cities across the United States. In the chart below, you can see that many Police Departments started actively using Twitter well before 2013 so they were excluded from this study since they already amassed large follower numbers in 2010-2012. Generally speaking, the more followers you get, the faster your growth snowballs. So the early adopter police departments like @BaltimorePolice which started actively Tweeting in 2009 have seen significant follower growth and long term success. Now the @BaltimorePolice account has over 261,000 Twitter followers. Lets dive into the Twitter follower numbers. As you can see below, this table is sorted in descending order in Column C (Current Twitter Followers as of Spring 2017). 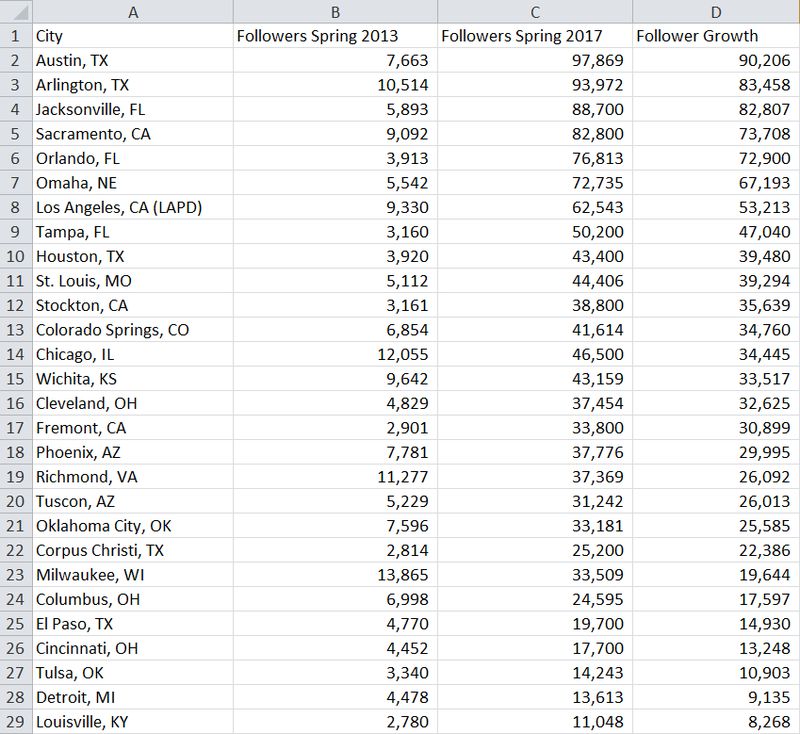 Column B shows follower counts in early 2013 which range from a low of 2,780 (Louisville, KY) to a high of 13,865 (Milwaukee, WI). Lets dig deeper. Are there any other numbers that might explain how cities like Austin, Jacksonville, and Arlington did so well while cities like Louisville, Detroit, and Cincinnati did so poorly? Sure, you could hypothesize that Austin is a “tech hub” so more people in that location might be into Twitter. However that doesn’t really hold water for Jacksonville and Arlington, TX. Arlington isn’t even the main city in its own metroplex, and they still had phenomenal growth. 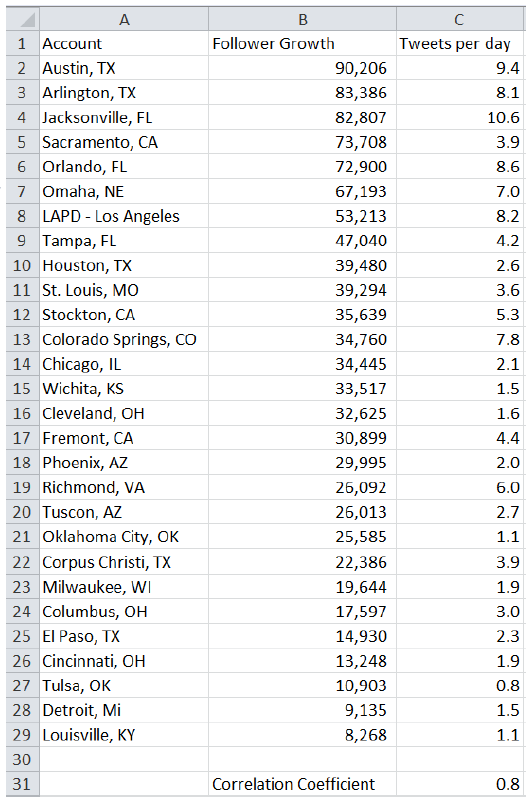 You might also think city population is the secret, however Lousville, Detroit, Cincinnati, Milwaukee, and Columbus are all relatively large cities compared to the others on the list. Using a great tool called Twitonomy.com, we were able to gather the average Tweets per day sent by all the cities we examined (based on the last 3,200 Tweets sent). As you can see below, the number of Tweets per day is highly correlated to Twitter Follower Growth! This all makes sense, right? Twitter moves fast. If you only Tweet once a day on average, barely any of your followers will even see that Tweet. The more you Tweet the more chances you have that one of your followers will like or retweet your message which will then lead to organic Twitter follower growth. 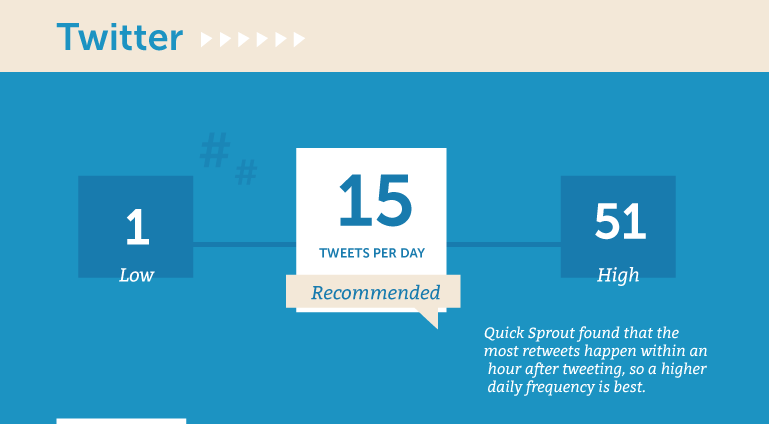 According to multiple studies the average lifespan of a Tweet even when factoring in retweets is only around 18 minutes. That’s why its almost impossible to Tweet too much as long as you aren’t sending out robotic spam Tweets. Check out the correlation coefficient chart below. The numbers above resulted in a correlation coefficient of 0.8. Which tells us that Tweet Frequency and Twitter Follower Growth are VERY highly correlated. Its really straightforward – the more your Tweet, the more Twitter followers you will receive. Interesting! What do the experts say? Studies vary, but on average experts recommend you send around 15 Tweets per day for optimal Twitter growth and performance. Going as high as even 51 Tweets per day had basically zero adverse affect on Twitter growth and performance. Do you think your Police Department could ever reach an average of 15 Tweets per day?? Up to 15 Tweets a Day!? @OmahaPolice Can Show Us How! You might be thinking it will be difficult or expensive for your Police Department to reach 10, let alone 15 Tweets per day. You are right, it could be a lot of work depending on how you manage it. 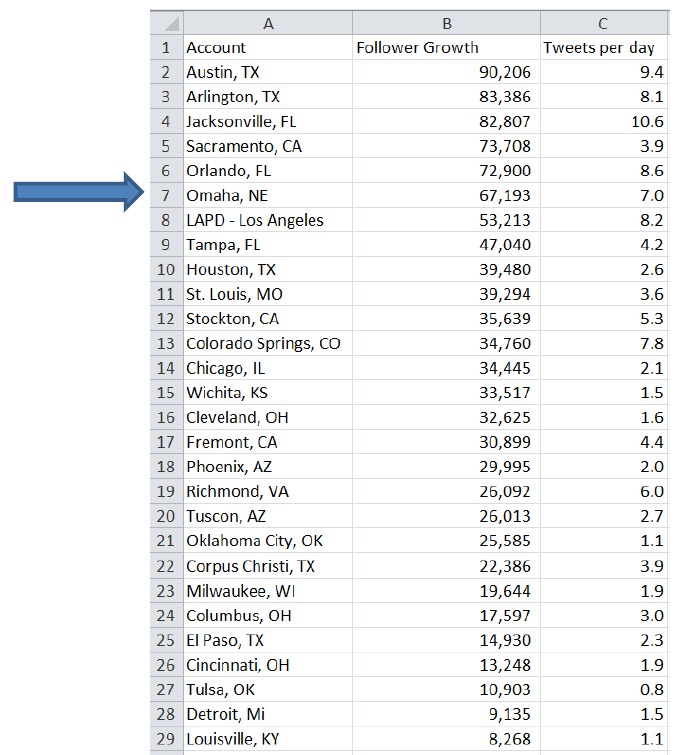 @OmahaPolice rank 6th in terms of follower growth at 67,193 followers gained since early 2013. That is nearly 2x the average follower growth of 38,390! We can see they have a Tweet frequency of 7.0 Tweets per day which is 7th highest in the list. How Exactly Does @OmahaPolice Use GroupTweet? @OmahaPolice have authorized over 30 Officers/Lieutenants/Chiefs to send Tweets from the official @OmahaPolice account via GroupTweet. The best part is that each approved officer is able to send Tweets directly from their own accounts. Contributors such as @OPDLtTierney or @OPDOfcBettin are able to use any Twitter app each of them prefers (such as Twitter for iPhone, Android, etc). No need to force all 30 contributors to use some cumbersome social media dashboard! This means that GroupTweet is software that your agency will actually use! Since signing up in 2013 – @OmahaPolice have sent a total of 10,106 Tweets. 9,112 of these, or 90%, have been sent via GroupTweet. GroupTweet saves your agency from sharing the password (keeps things secure) and there is no need to train everyone to learn a new and overwhelming social media dashboard. No need to place all the burden of Twitter content generation on the shoulders of one or two individuals. To give you some perspective of how some other law enforcement agencies are using Twitter, the aforementioned IACP survey showed us that 44% of Police Departments are letting multiple individuals send out Social Media posts without specific approval of some central administrative group. This is across all types of social media. When considering Twitter specifically, its an even better platfrom for a collaborative tool like GroupTweet. For example, with Facebook, you might only publish a couple posts a day, so its fine to have one person crafting the perfect post. However, with fast moving Twitter, its going to be hard for one person to get out 15 Tweets per day. This might sound scary for a government or law enforcement agency to hand over control to so many contributors, but don’t worry, GroupTweet has tools to help you succeed. GroupTweet offers built in “Tweet moderation” functionality that you can enable on your account. Its a great way to start out until your officers get a handle on publishing Tweets. GroupTweet moderation allows you or several “admins” to approve each Tweet before its published from the official account. Admins will receive an instant email notification that a Tweet is awaiting moderation. From there, admins can approve or deny the Tweet simply by clicking a link right in the email. Once you and your contributors get comfortable you can always turn the moderation off if you wish to avoid having to approve messages each time. GroupTweet is much more secure than simply sharing the password with multiple employees for a number of reasons. First, there is a full audit trail of who sent each message. If you share the password, you will have no record of who sent each Tweet, who changed your Twitter settings, or even who changed the password. Second, GroupTweet dramatically decreases risk of phishing attacks like the one that hacked the official @AP account and many other big name Twitter accounts. Lastly, GroupTweet works seamlessly with Twitter’s two factor authentication, so you can rest easy knowing your account is secure. Officers can either Tweet from the GroupTweet dashboard (logging in with any email address or personal Twitter account) or straight from their phones using any Twitter app each of them prefers (ie Twitter for iPhone, Android, etc). If you use GroupTweet, the burden of content creation for the department Twitter account isn’t entirely on the PIO’s shoulders. He or she can do something more productive with their time. Even if your department is fortunate enough to have staff dedicated to social media, now those staff members are freed up to work on other tasks like responding and engaging with community members instead of having to stress about coming up with the perfect piece of content 15 times per day. GroupTweet is also perfect for smaller law enforcement and government agencies who might not be able to afford dedicated social media staff members or expensive and cumbersome social media dashboards. With GroupTweet, its easy for multiple individuals to all chip in when they are able to. Lastly, because its so easy to use with the regular Twitter for iPhone and Android apps, the GroupTweet learning curve is quick and easy. No complicated or overwhelming social media dashboards to learn. It’s all pretty straightforward. The more contributors you add to your account, the easier it will be to increase your average Tweet frequency. 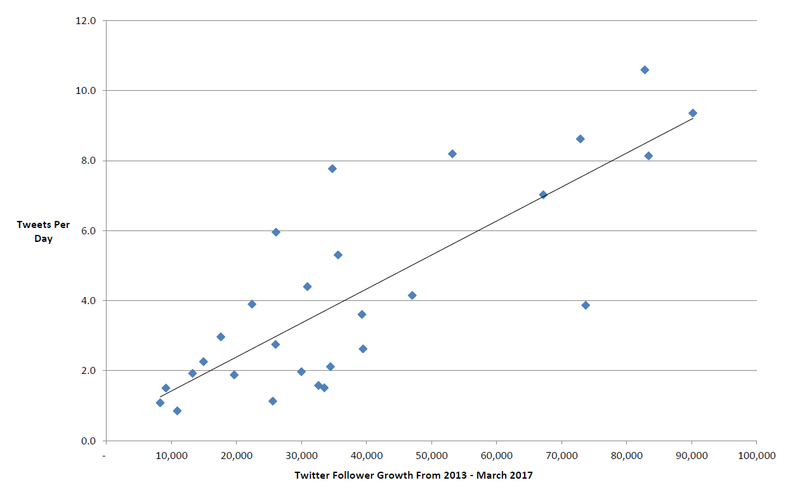 From the data we looked at above, we know increased Tweet frequency almost always leads to Twitter follower growth. The Boston Police department used GroupTweet to notify the public about important public safety concerns in 2013 during the tragic Marathon bombing events. The Harvard University Kennedy School published a whitepaper examining the lessons we can learn from how the Boston Police department used social media and GroupTweet to accomplish their goals which you can read here. Below is an example of a Tweet by @BostonPolice sent via the GroupTweet platform in an attempt to notify the public of safety concerns. Cheryl Fiandaca, BDP’s public information chief, was one of the authorized GroupTweet contributors who was able to quickly and efficiently send out Tweets that day. In times of crisis its important to get out the message quickly and correctly. You need to have contingency plans for your agency so that multiple people have access to the Twitter account in a safe and secure way. If only 3 people had access and for whatever reason, weren’t available at the time of an incident, that would not be a good situation. GroupTweet provides this functionality and ensures this isn’t an issue. @OmahaPolice is a great example of a law enforcement agency using Twitter for community outreach and engagement. As mentioned, they have over 30 contributors sending Tweets from the official @OmahaPolice account. They have setup official OPD twitter accounts for their various officers. For example, you can see below @OPDOfcFehrman has his own official account. As you can see below, @OPDOfcFehrman was at the College World Series in Omaha and shared a cool video with all the followers of the @OmahaPolice account. This allows the people of Omaha to get to know the officers in their community. Instead of a faceless PIO, sitting behind a desk, carefully crafting and engineering an overly manufactured “PR Approved” Tweet once a day. @OmahaPolice’s feed is authentic! They highlight the many different voices of their department every day. @OmahaPolice demonstrates great community outreach and engagement, as it allows your community followers to really interact and engage with your officers. Your citizens and followers can really connect with the many officers that make up your agency in an authentic and meaningful way. Additionally, as we see in the example above, GroupTweet is a great way to share pictures and video. No need for the officer to download and send the video from his/her phone to the social media coordinator, who then would have to download the attachment, re-upload, and craft the tweet. With GroupTweet, @OPDOfcFehrman simply sends out the video Tweet and it’s instantly retweeted from the official @OmahaPolice account. You can see the @OmahaPolice followers loved the Tweet displayed above. Over 16 retweets and 101 likes (and counting). @LPD1420, aka Officer Jackson-Goodwin, is using GroupTweet to post authentic and engaging Tweets to all the followers of the @Lincoln_Police account. @Lincoln_Police just started using GroupTweet last week, so we can expect their 6,000 Twitter followers to grow very quickly in the coming months! @OPDSgtOetter sent the following Tweet from the @OmahaPolice account using GroupTweet. The “Bomb pop with a cop” campaign is a great way to improve public relations within your community! GroupTweet is the perfect tool for notifying the public of traffic and other “noncrime” issues in a timely manner. As you can see below, @OPDOfcPecha was able to quickly and easily send out a detailed and informative update straight from his phone. The more contributors you have on your account, the more likely you’ll be able to send out timely and relevant information to your followers. For tweets like these, timeliness is key! If @OPDOfcPecha had to first send this update via email to the one person in charge of authorizing and approving Tweets, then you can imagine how that might limit the usefulness of the information. By the time the message is received by the social media coordinator and then approved by the “admin committee”, the road that @OPDOfcPecha told us was closed might be re-opened! The information would no longer be useful, and more importantly, might actually might cause problems due to the delay it takes to post it from the official @OmahaPolice account. With GroupTweet, your contributors Tweets can be configured to be delivered instantly to your followers, so you never have to worry about stale and outdated information being delivered to your followers. Below we see how @BostonPolice used GroupTweet in an attempt to solicit tips from the public. In the case of the Marathon Bombing, it was extremely important to get the message out as quickly as possible since the fugitives were still at large. GroupTweet enabled @BostonPolice to get this message out quickly and efficiently. If you have made it this far, I hope you have learned how Tweet frequency is directly correlated to Twitter follower growth and overall Twitter success. I am biased, but I think the easiest way to increase your agency’s Tweet frequency is by adding a lot of GroupTweet contributors to help you Tweet. You will discover that adding contributors increases the amount of engaging, timely, and authentic content that your account will publish. This in turn leads to happy and growing followers! If you have any questions about how this might work for your agency, please do not hesitate to contact me at ryan@grouptweet.com. If you prefer phone, you can reach me at: (312) 572-9870. If you want to see the all the details from the case study, view the PDF here. Bonus Tip – Get Your Official Agency Twitter Account Verified! If your official government agency Twitter account isn’t already verified, then you need to do that ASAP! It’s a quick and easy way you can really improve your Twitter effectiveness. Luckily, Twitter has made this process much easier than in the past. They now have instructions for their online application process here. It only takes a couple minutes to complete. Heyaa , Great post, thanks for sharing. automation and it worked pretty legit. Have you tried it?